Why? 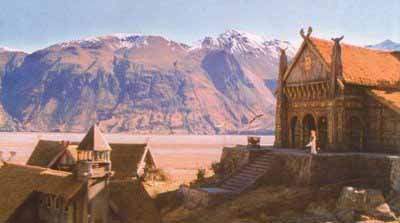 Edoras, Danelaw England, Dark age Dublin (and the rest of Ireland), Russia in WWII, Bretonia, Dark age Scandanvia, Vietnam, and many more locals feature houses with thatch roofs. Shingles are simple, but thatch roofs are tough to do well. Many gamers have come up with many ways of doing thatch, but which is the best? The cheapest? The fastest? The easiest? These are all important questions, and this article will attempt to scratch the surface, or be an authority on the subject, read it and decide for yourself! There are many ways to put some thatch together on a roof. Some of them are more popular than others, and some take a lot more work than others, so only a handful of the ones that either I have done myself, or that are very popular will be discussed here. To start things off lets look at the current Games Workshop favourite method: Fun fur. Fun fur has really come a long way since the viking age (yes, the vikings made their own fun fur!). It really looks like fur nowadays, and that is the problem with it. 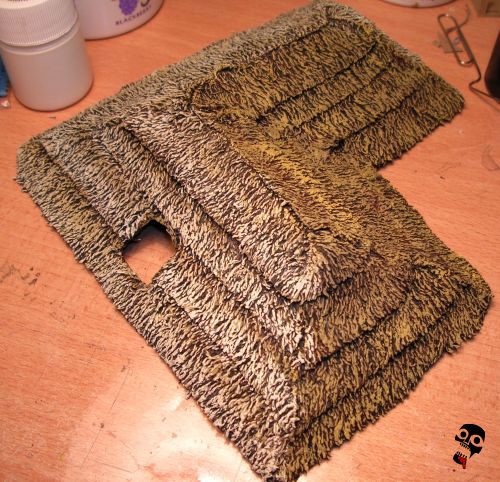 Often I have seen pictures and tutorials that outline how to put it on roofs as thatch, paint it and finish it, and often I have made the comment 'It looks like a furry roof!'. Still, some furs are better that others for thatch. Personally I like the shorter furs, they look a bit more realistic and less, well, furry. So how hard is fur thatch to do? Not too hard, basically you cut it up, glue it onto your roof and blammo, you are done. If you were lucky and got some fur that was black or brown then all you have to do is apply a watered down PVA glue to it and once that dries highlight it. Not too much work, and all for the cost of some fun fur. Of course, fun fur is pretty specialized, typically only available at hobby shops, fabric stores, and from one of your daughter's old teddy bears! So what else is there? Cut Cardboard is another option, one I dreamed up myself actually. So how does it compare to fur? Well, it looks kinda like thatch, but a very much neater and tidier version. The strips of thatch are all very straight (relatively anyway), but still thatchy enough to do the job. Ultimately though, it really only works for those who like the neat and tidy look, which is not typically a natural thatch look. 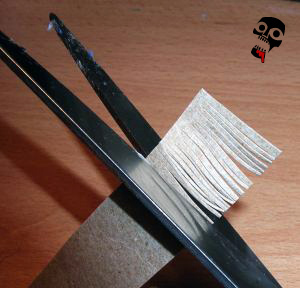 It also doesn't add any volume, there is no poofy thatch look to models done using this method at all. Thatch or strips of cut card?? As far as cost and ease this one gets mixed results. It is very cheap to do this one, all you need is some left over packaging from your favourite processed food stuff and a pair of scissors. However, the time it will take you to cover a large or even medium sized roof will more than make up for the cost. Not only does it take a long time to cut enough card for such a roof, but you will also likely have a hand cramp and be bored out of your mind by the end of it. That being said, I did three medium sized roofs with it, so it couldn't have been that bad. Painting wise it is easier than fur because it doesn't require the glue phase (as it is pretty rigid once put in place, being cardboard afterall). If you use black card then you don't even need to undercoat it at all! But ultimately it was too much work for me so I had to try something else. So what else was there left to try? Cut Hand Towel was a method that I found when I did a Google search on the subject. 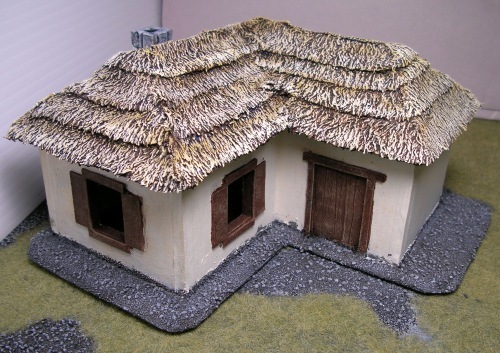 I found a great little tutorial at Ryan Skow's Website called Thatched roof. What a score it was. 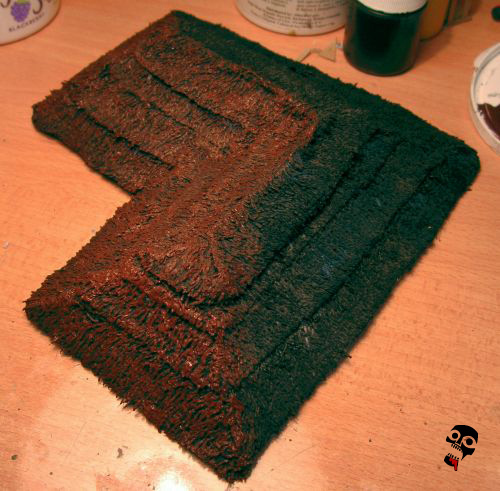 The thatch that an old towel could produce actually turns out quite realistic. It creates a suitably scattered look, while also adding the volume that a lot of thatch should add to a roof. Of the three methods discussed so far, it is probably the best looking one hands down. Thatch or cut old hand towel? As far as ease and cost effectiveness, this one scores well in both categories. It is very easy to do. Once it is cut into strips all you have to do is glue it on and paint it. It does require the wash of watered down glue to make it rigid, but the time you save in putting it on the roof makes up for this easily! It is also quite cheap. Using an old tower is probably the cheapest way to make thatch. Ideally using a black towel is best, but not all that much better (see tutorial below), so an old towel that is kinda ratty that you have been using for some time will do perfectly, and it is basically free! So why look for something else? Binder's Twine is a method I came across while promoting the hand towel method. I thought the towel method was pretty good but the guys over at One-Ring scoffed! It was difficult for me, and when I asked why they mentioned that there was a more realistic method out there. I did some investigating and found out what it was. Basically, this is done by cutting lengths of twine and untwisting it, Once it is untwisted, but still sorta grouped together, it is then glued into place on the roof in layers, or erratically. It is a very tedious method. It does look good, but there are better ways to do it... Those I will discuss below. Resin, pre-built terrain is often quite popular. The quality varies from manufacturer to manufacturer. 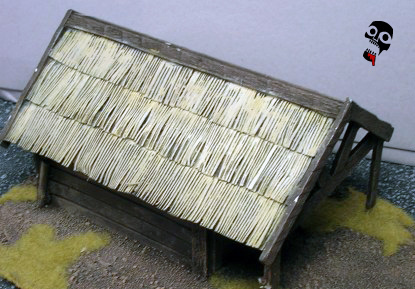 Resin thatch roofs can look very convincing, but they can also loook like some sculpting putty blobbed on a roof and scored with lines. Here I will compare some brands to see how good and bad they can get. Thatch or scored sculpting putty from JR Miniatures? 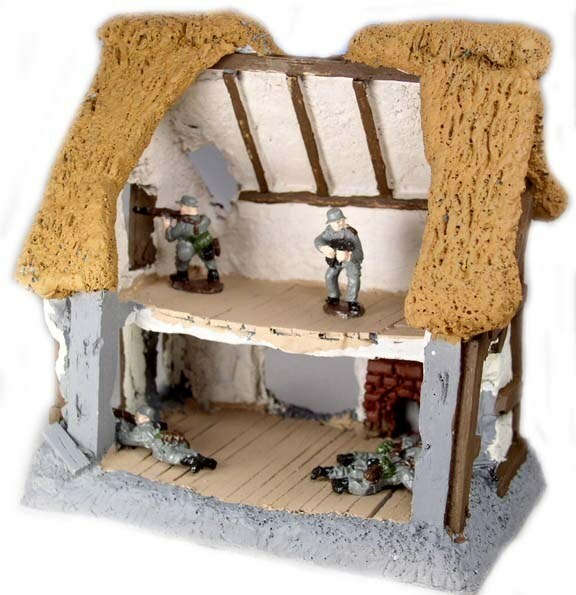 JR Miniatues does a line of 28mm WWII houses as well as other stuff with thatch roofs. 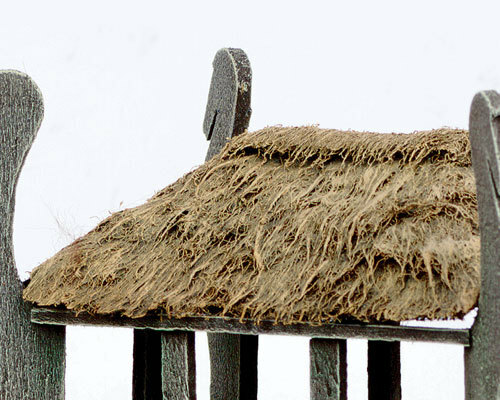 Personally I think the quality of the thatch loses to all three methods including fur, cut card, and old towel. From the image above it simply looks like a very haphazardly layed piece of putty with some scores in it. Of course, it could be improved or made to look better with a better paint job. Still, the price of this resin kit is much more than the price to build a similar piece with an old towel and some foam core. 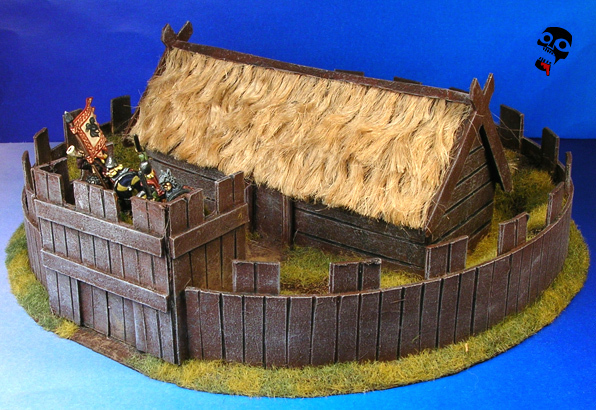 Thatch or scored sculpting putty from The Miniature Building Authority? 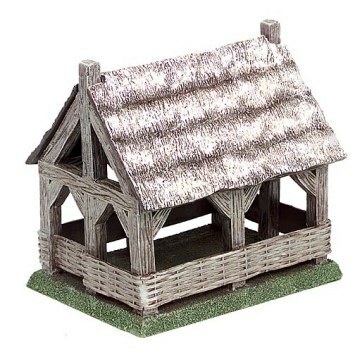 The only thatch roof from the Miniature Building Authority looks very much like the cut card. It is flat and volume-less, but still not too bad overall. It is likely a lot easier than the cut card method to put together, but also a lot more expensive. Certainly it is more expensive than the old towel method, and I personally don't think it looks as good. Thatch or scored sculpting putty? 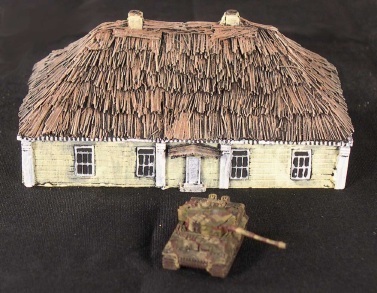 The above building is actually a 15mm thach roof on a Russian farm house. It looks suitable shaggy and even has the volume. I would say hover that it looks a bit too grassy for its scale. Of course, it is 15mm afterall, so som leeway has to be given. Still, I think the old towel method wins for both look (even in 15mm), time it takes to do, and price in the end. But now that you have seen many of the options, you can decide for yourself! And so the card cutting begins, but will it ever end? 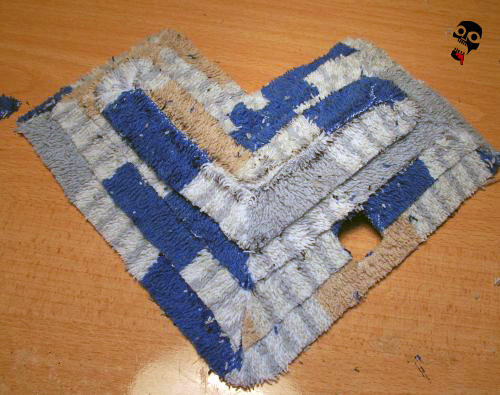 Once you are all ready, lay each strip starting from the bottom so that the grain of the towel or cut card flows downward. Make sure you get this right at this point because it is very difficult to fix once subsequent strips are applied and the glue is dry! To lay the strips spread a liberal amount of glue around evenly and place the strip. The glue will hold both the towel and the card very well. And so the untwisting begins, but will it ever end? If you want to use twine, the method is quite similar to the card method, but instead of cutting strips of card, you untwist twine. It is difficult to do all of the untwisting at once, so I find that I cut(1), untwist(2), untwist again(3), and then glue it down(4) for every piece I put in place. This method makes the project less efficient because you can't focus on one aspect all that easily. This is very time consuming and not necessary. It is a lot easier to do this with doll hair. 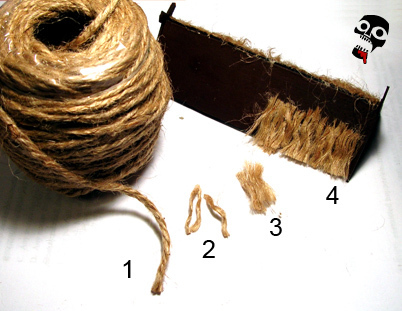 A blond or dark blond hair could easily be used, and would look pretty much the same but would not require any untwisting, which is by far the most time consuming aspect of the twine method. Laying down the thatch is pretty short and sweet. At this point it is worth going in to a few key differences between cut cardboard, twine and an old towel. With the old towel you really don't have to worry about what to do at the top. You can either lay a single piece down along the top, or you can pinch the top of the final two pieces together. With the card this won't work. You actually have to run a piece of balsa or card accross the top to cover up the gap, which effects the historical accuracy of the piece as this was typically not done. This is also an issue with the untwisted twine. Although it is possible to put twine across the top, it is tough to make it look good without doing a couple of layers. The entire roof is covered with thatch, now time to glue and undercoat. So, once the thatch is in place, it is time to undercoat. If you are using card you should pait until the glue should be somewhat dry. With the old towel method, whether the glue is dry or not is not a big issue. When using the towel method, water down your black paint considerably, but also add a liberaly amount of white (PVA) or wood glue to the mix. This water, paint, glue mixture will stiffen the thatch so that it will be easy to paint once dry. For the card thatch, the paint will dry quickly, so painting can begin in short order. With the towel method you have to make sure it is completely dry (or almost so) before painting, so likely it will have to wait until tomorow. The first two phases of painting: The undercoat(1) and the brown coat(2). Once the undercoat is dry, apply a liberal amount of brown paint to the roof. Apply it in relatively thin layers to make sure that it dries in a reasonable time. No need to water this down, and try to leave some black paint in the deepest parts to add texture. By the time you finish the whole roof, the part you started on should be pretty dry. Once this is done, add some yellow highlights to the roof, not as much yellow as brown as you want some brown to show through to create depth. Finally, do a heavy dry brush with ivory. The second phase of painting: The yellow coat(3) and the ivory highlight(4). Once the painting is all done it is time to enjoy your work! 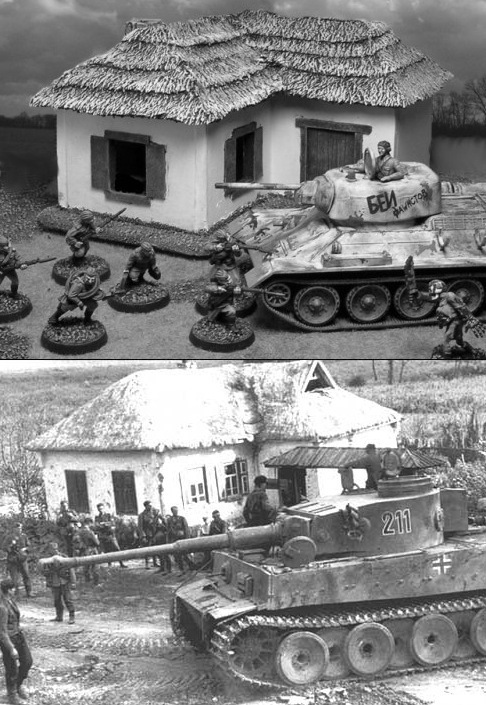 Get those Dark Ages/Lord of the Rings/Soviet figs out and go at it! Make the building an objective and that way you can be sure to show it off to everyone playing! The finished house, with the reference picture for comparison... And what else?